Students protest to demand that the University of Manchester divests from companies complicit in Israeli war crimes. Photo: BDS. In the last few years there has been a big spotlight put on “the left”, and the antisemitism that seems to run rampant within it. With this in mind one would assume that existing left leaning groups would proceed with caution and vigilance. I guess BDS didn’t get the memo. 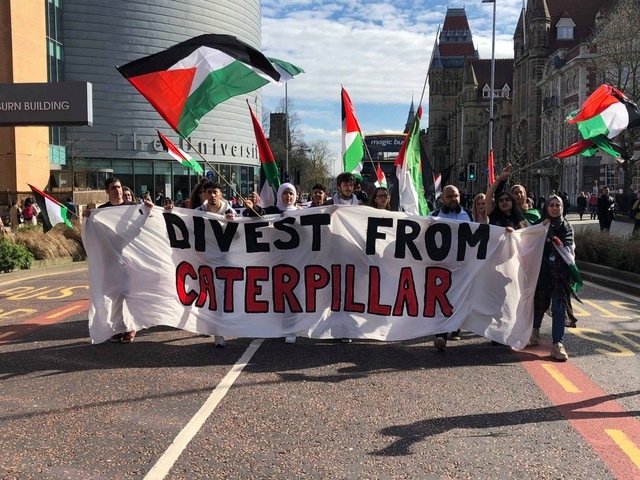 Recently, campaigners from the BDS (Boycott, Divestment, Sanctions) group stormed a meeting of the Board of Governors for the University of Manchester demanding that they divest from Caterpillar, who manufacture equipment for the Israeli Defence Forces. The University claims “that Caterpillar’s stance continues to be that it does not have the practical ability or the legal right to determine how its products are used after they are sold and that it does not have plans to boycott sales to any country that is not sanctioned by the international community”. BDS posted a video of their action on their Facebook page which caught the eye of a certain Asa Winstanley. Now, this name probably doesn’t ring a bell with most people but let me tell you a little bit about him. Amongst many things, he has accused Miriam Mirwitch, the Jewish head of Young Labour, of belonging to a front group for the Israeli embassy. He has suggested that the antisemitism crisis in the Labour party is entirely fabricated by Israel. This isn’t about one isolated incident but a near pathological fixation with Israel, and dog-whistle conspiratorial antisemitic tropes. Now, you may wonder what this has to do with BDS. Well, Mr Winstanley wrote a piece in The Electronic Intifada about their protest, an article which BDS then shared. “Superb coverage” as they put it. Understandably, I assumed that this was some sort of oversight. An overzealous reaction to getting some coverage that extended beyond the confines of the University campus. I could not imagine that they would knowingly share someone like this. Quite the contrary; upon alerting BDS about this, I was met with a frosty reception. In defending their choice to share the article, they cited a Jewish academic, Dr Eyal Clyne, and the group Manchester Jewish Action for Palestine. Dr. Eyal Clyne had said, “it is not clear to me what is antisemitic about a student society sharing an article that covered their own action”. Now I am not accusing BDS of antisemitism. It is their response to me, in trying to honestly point out Winstanely’s history, that I am objecting to. Dr. Clyne understandably said that “crying wolf about antisemitism is dangerous”. However, I argue that so is ignoring it. After a quick search I found a long blog post by Dr Clyne called the “the lost context of the holocaust”. And whilst the title alone is cause for concern, the actual content was even more worrying. It is a long winded text that seem to attempt to relativise the horrors of the Holocaust, at one point comparing Nazi Germany’s violence against Jews to the Allies’ bombing of German cities. BDS also quoted The Manchester Jewish Action for Palestine group in their response to me. Quite understandably, they draw a distinction between antisemitism and opposing the actions of the Israeli State: “As Jews, we cannot accept the Israeli state speaking in our name. To claim that such a regime represents us, or that criticising Israel’s lobbying abroad is somehow against all Jews, is itself antisemitic, because our Jewish values have nothing to do with [Israel’s] policies”. However, they also maintain an unbelievable blind spot when it comes to Winstanley. They wrote: “As Jews in Manchester there is absolutely nothing antisemitic about the writing of Asa Winstanley, especially his work on Israel’s lobby in the UK”. What is alarming in this whole situation, is BDS’ total resistance to reflect. The defensiveness and lack of sensitivity. Why are they so reluctant to even entertain the possibility that perhaps they made a mistake? As someone who has always supported and felt deeply about Palestinian emancipation, it’s incredibly distressing to see a preeminent Pro-Palestine group, not taking antisemitism seriously. In the name of self aggrandising faux radicalism any critique is taken as attack rather than as a means of self improvement. I think this speaks to a wider menace within the left, and if we don’t address it with the urgency that we do other forms of racism we will see devastating repercussions.